This drama is a retelling of a well-know love story between a goddess and a mortal. Goddess Xiao Qi (Ariel Lin) commits a major crime. She is punished by stripping her powers and is banished to the mortal realm. She can only regain her goddess status by accomplishing 100 charitable acts. 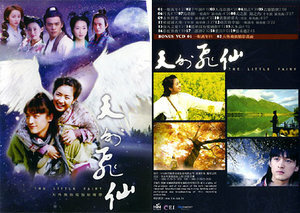 Dong Yong (Hu Ge) rescues her and teaches her what its like to be a mortal. However, she also learns how to love and love is forbidden between goddesses and mortals. And, when their love affair was discovered, heaven guards descended onto the mortal realm to separate the two lovers. However, they want to do everything to stay together.